Remember that day a few months ago when I was sick with a pounding headache, but decided to go ahead and catalog my yarn & fiber stash? It looked a little like this. In any case, this weekend I learned the true magnificence of what I’d done. 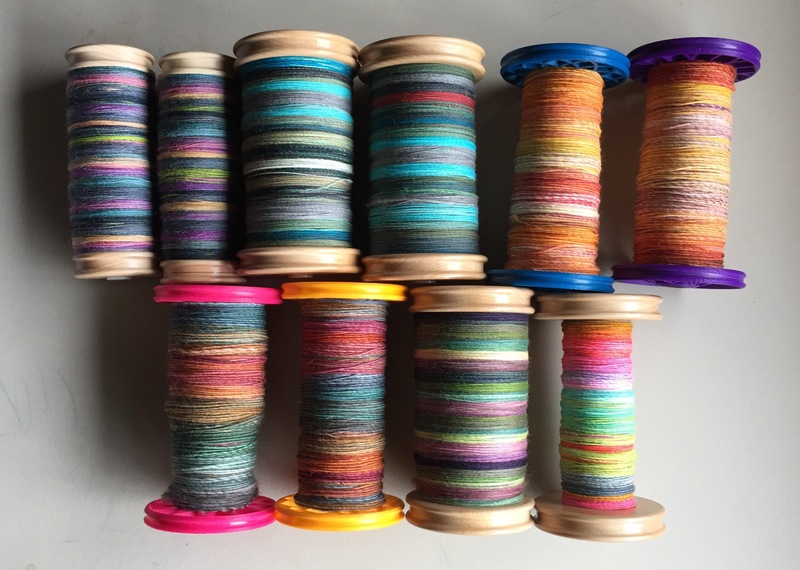 I’ve mentioned here that I’ve been selected to be a tester for the Akerworks Flat Pack Lazy Kate trial and ever since I found out I’ve been working hard to fill bobbins for multiple plying scenarios. So far, this is what I’ve got. I’m slowly working my way toward being out of bobbins to fill, a great problem to have if you ask me since that means I’ll have a whole lot of fantastic handspun yarns completed shortly. 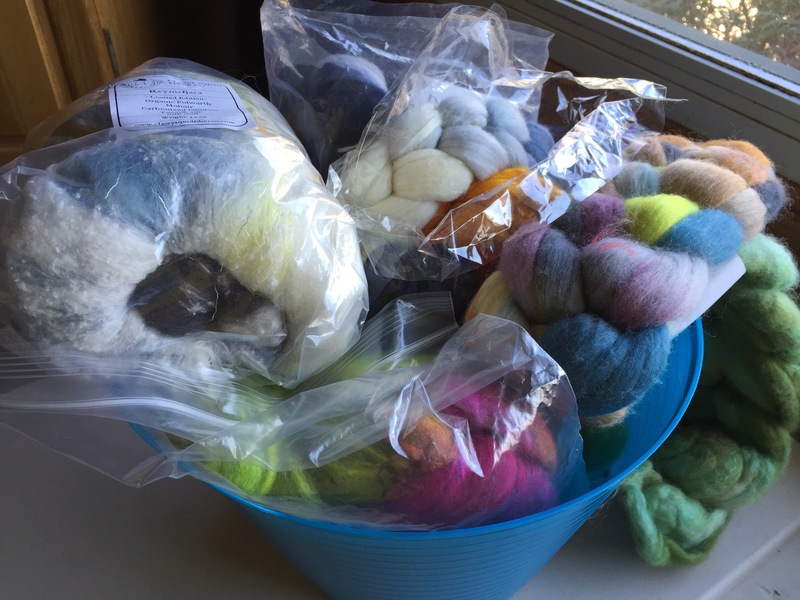 The other amazing news is that the little basket near my wheel where I keep what I like to think of as my ‘on deck’ fibers (like batters in baseball, these are the fibers that are up next to be spun) is slowly being emptied. Now I’m someone who thrives when I can jump directly from finishing one project into starting the next. The key is that when I have everything lined up for my next project before finishing the current one, I can cast-on or start the next spinning project immediately. No empty needles, no excuses to not get that next project on the wheel. I just go and then I always just have something going. It works for me. 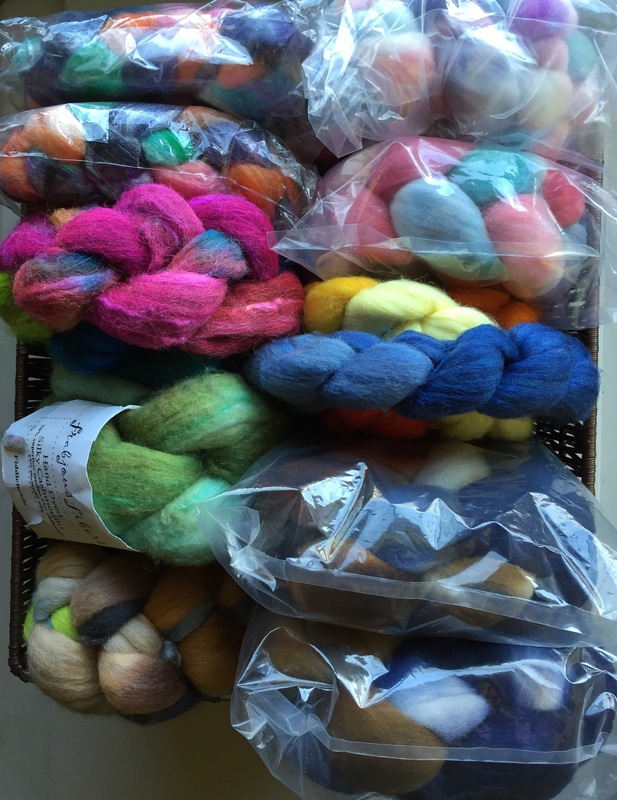 In any case, with my ‘on deck’ basket reaching a state of being critically low on fiber, I had the brilliant idea to go shopping… in my own stash! 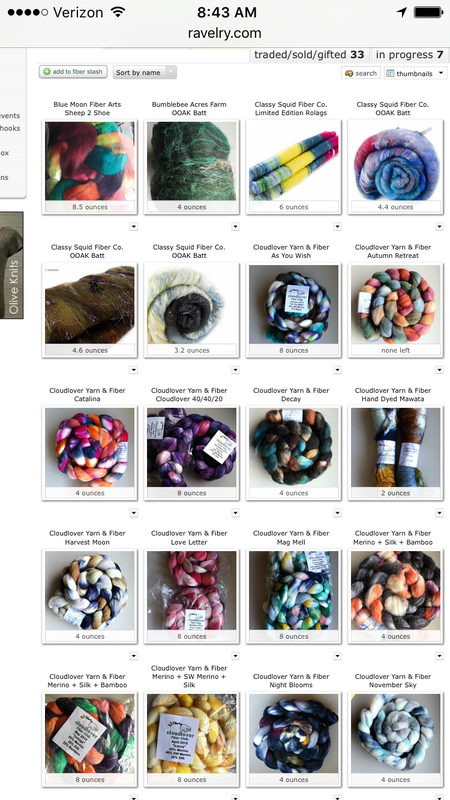 I pulled out my phone and hopped onto Ravelry and went straight to my fiber stash. 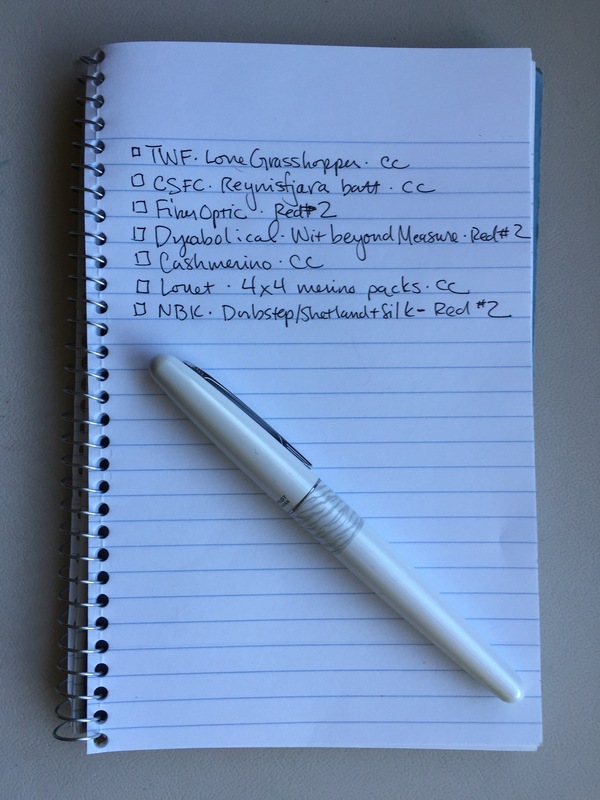 As I browsed, I took notes on what fibers I wanted to bring out and where they were located. And can I just say — wow! — was having the location of everything so efficient! I’m so happy I noted that in my stash listings. I grabbed a basket and went shopping. Sure, there was a little digging involved — I won’t lie, there are some… layers to my stash, but it was the easiest and most enjoyable stash dive of my life. Without 15minutes or so I returned with my basket full. And I went about the business of tucking the reinforcements into my little ‘on deck’ basket. Now I realize that it would have been a much prettier picture if I’d have taken all the fiber out of the plastic, but I thought I’d leave it so you can see it as it is in real life. I tend to leave fiber in its original packaging until I’m ready to spin just to minimize dirt and dust that gets onto it. Not all fiber comes in plastic — which is fine, I just usually make sure that gets tucked away in my cedar chest until I’m ready to spin it. With wild excitement, I retold my incredible ‘shopping experience’ to my husband last night. It’s our 13th wedding anniversary today and while he kind of looked at me like I was crazy, it was the “that’s my crazy wife“ look that I’ve come to know and love. Maybe I should have reserved my enthusiasm for like-minded fiber addicts, but — let’s be honest — if I had done that just wouldn’t be me. 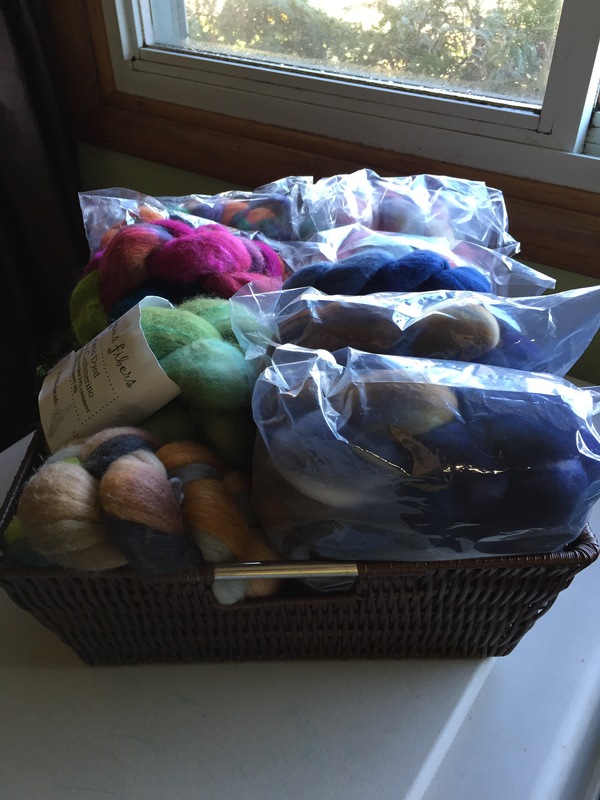 In any event, I went back to my wheel and my freshly filled spinning baskets and looked over the bounty of my ‘order’ and got back to spinning away. After all, my next project is all set to go. I love this story! Too much fun! It *was* too much fun! I’ll have to spin my little heart out so I can do it again soon! Looks like fun! I love shopping in the stash. I do, too, but making it a little more ‘official’ for the first time I found to add a new layer of fun for me! I know the look on sig ot’s face you speak of. 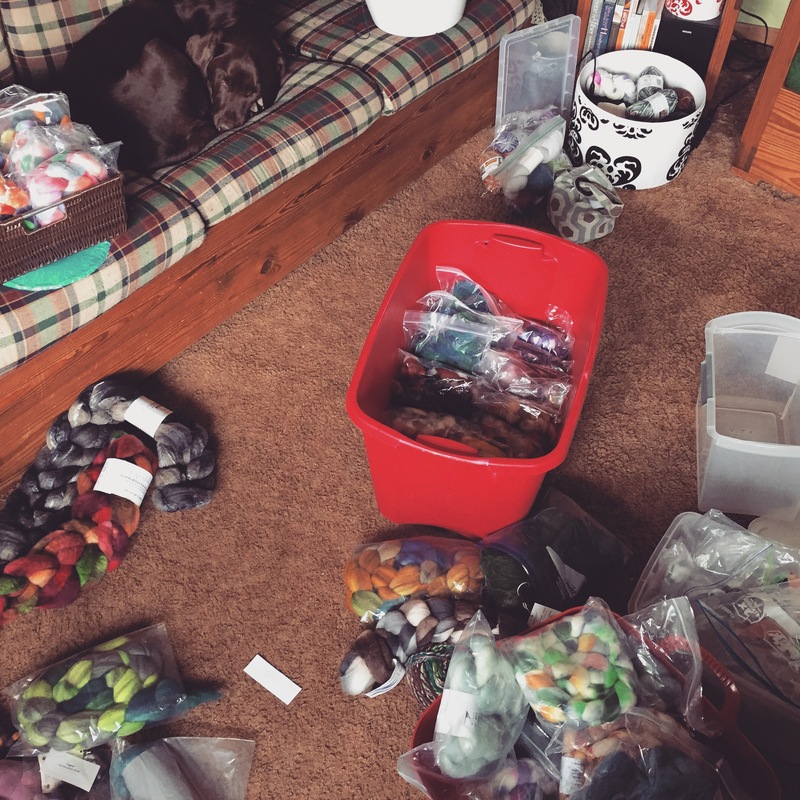 When I created a database of all my yarn, including wgt/yardage and began shopping my stash for patterns/projects, I excitedly told Jeff how much fun I was having “shopping” without spending money. As he is Type A/OCD, he was like “duh? !” Not news to him! Now if only he could see the wisdom of creating stash! LOL! I’m mostly just happy that he lets me do my thing. The fact that I see to mildly amuse him with my weirdness sometimes is a bonus! Your basket looks bountiful and wonderful – and what fun that you could do all of that shopping and not bust the budget!